Southern Mozambique, 1894. Sergeant Germano de Melo is posted to the village of Nkokolani to oversee the Portuguese conquest of territory claimed by Ngungunyane, the last of the leaders of the state of Gaza, the second-largest empire led by an African. Ngungunyane has raised an army to resist colonial rule and with his warriors is slowly approaching the border village. Desperate for help, Germano enlists Imani, a fifteen-year-old girl, to act as his interpreter. She belongs to the VaChopi tribe, one of the few who dared side with the Portuguese. But while one of her brothers fights for the Crown of Portugal, the other has chosen the African emperor. Standing astride two kingdoms, Imani is drawn to Germano, just as he is drawn to her. But she knows that in a country haunted by violence, the only way out for a woman is to go unnoticed, as if made of shadows or ashes. 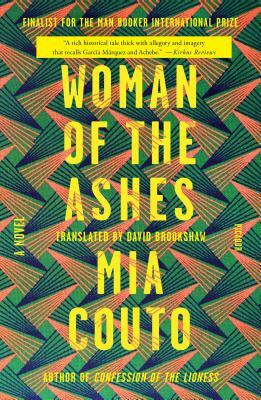 Alternating between the voices of Imani and Germano, Mia Couto’s Woman of the Ashes combines vivid folkloric prose with extensive historical research to give a spellbinding and unsettling account of war-torn Mozambique at the end of the nineteenth century. Mia Couto, born in Beira, Mozambique, in 1955, is one of the most prominent writers in Portuguese-speaking Africa. After studying medicine and biology in Maputo, he worked as a journalist and headed several Mozambican national newspapers and magazines. The author of Confession of the Lioness, The Tuner of Silences, and Sleepwalking Land, among other books, Couto has been awarded several important literary prizes, including the 2014 Neustadt International Prize for Literature, the Premio Camões (the most prestigious Portuguese-language award), the Prémio Vergílio Ferreira, the Prémio União Latina de Literaturas Românicas, and others. He lives in Maputo, where he works as a biologist.